Molecular and structural biologist Manuela Hospenthal is researching the spread of antibiotic resistance in bacteria. She wants to discover how bacteria exchange and take up genetic information. Her research focuses on understanding how DNA uptake and translocation across bacterial membranes is achieved. “That wasn’t planned,” Manuela Hospenthal says, shaking her head. She left Switzerland just over 20 years ago, as a 12-year-old girl, but now she’s come back. In November 2018 she set up her own research group at the Institute of Molecular Biology and Biophysics (IMBB) and recently recruited her first two doctoral students. 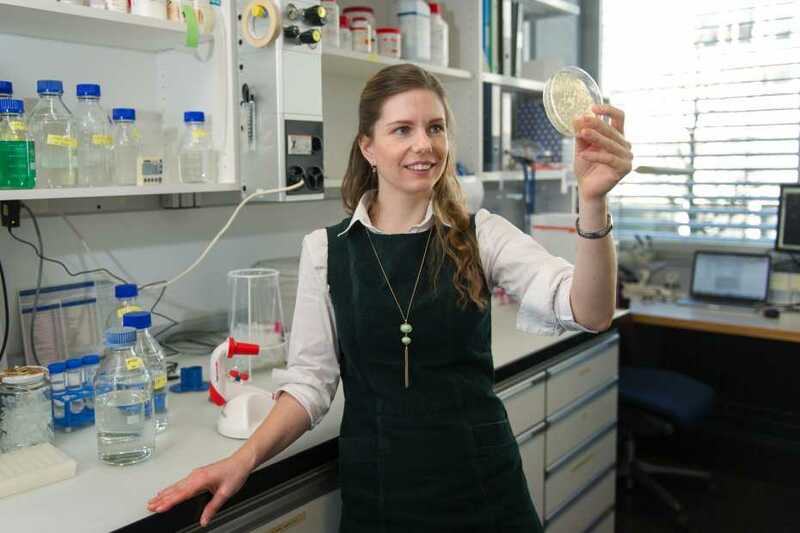 Supported by a PRIMA grant from the Swiss National Science Foundation (SNSF) to promote female researchers, she plans to spend the next five years researching how bacteria exchange genetic information with each other through a process known as horizontal gene transfer. This process has widespread consequences for the evolution of bacterial populations in general. “Once we know how bacteria transfer their knowledge, we can find ways of preventing it, or even exploiting it," the researcher says. Since November 2018 she has been researching this topic in Switzerland, a country that was just a childhood memory for the 32-year-old. Originally from Arth-Goldau in the canton of Schwyz, she moved to New Zealand with her parents and younger brother in 1998. Her father, who organised cruises and had travelled a lot, was inspired by the country on the other side of the globe. The family’s new home was in Whakatane, a small town in New Zealand’s North Island. “It was like paradise to me,” she admits. “My primary school was very close to the beach, with a view over the sea.” During their lunchtime breaks, pupils were free to jump in the pool or play cricket or tennis. This was ideal for the sporty schoolgirl, who had previously taken part in gymnastics competitions in Switzerland. From there on, Hospenthal was very determined in following her path. After completing her Bachelor’s and Master’s degrees in biomedical sciences at the University of Auckland, she was keen to do her doctorate in Europe. Searching for a doctoral post, she applied at the renowned MRC Laboratory of Molecular Biology (LMB) in Cambridge. “I was particularly fascinated by the power of structural biology to illuminate life’s processes at the molecular level,” Hospenthal recalls. Soon after submitting her application she was called for an interview. But to finance her doctoral studies, she needed a scholarship – and the LMB typically only awards up to four LMB Cambridge Scholarships to international applicants every year. With the 2009 Nobel Prize in Chemistry having been awarded to Venki Ramakrishnan at the LMB, the institute experienced a significant boost in applications for the 2010 cohort, which meant the competition for a spot was fierce. After some initial setbacks, the young biologist impressed her interviewers and was offered a spot. “It certainly helped that I don’t let setbacks stop me,” she recalls. For her doctoral thesis in David Komander’s group at the LMB, Hospenthal worked on a small protein modifier called ubiquitin, which can “tag” other proteins to mark them for degradation, a normal process in our cells. At that time, it was becoming clear that ubiquitin also coordinates a myriad of other cellular processes, not just protein degradation – and these “atypical” ubiquitin signals became the focus of her PhD. Her new research group at ETH Zurich is also studying proteins anchored in bacterial membranes. These molecular machines are responsible for taking up and translocating DNA from outside the bacterial cell to its interior, where the cell can then integrate it into its own genome. This DNA may originate from other, dead bacterial cells or from DNA that other bacteria have released on purpose. The net effect of this is that bacteria can harness the genetic information from others to potentially gain novel advantages in a given environment. The scientist wants to establish how these DNA-uptake proteins function, so as to potentially inhibit DNA transfer in future. Her return to Switzerland was prompted both by her love of research, and her love for her partner, a synthetic biologist from Neuchâtel whom she met in Cambridge. “ETH has an excellent reputation and world-class infrastructure, is close to both our original homes, and we can continue our research here.” It’s only the question of raising of family that still needs to be resolved: “We are certain we’d like to have children, but we still don’t know how we will manage to organise everything,” she admits. But she does at least have an idea: after finishing high school, Hospenthal spent a gap year working as an au pair in Spain, where she looked after two children whose parents were biologists and both had their own research groups. She hopes that she will be able to follow their example. “I simply couldn’t imagine a life without research,” says the scientist.